B Drill Hole Dia. C C'Sink Dia. Step 1. 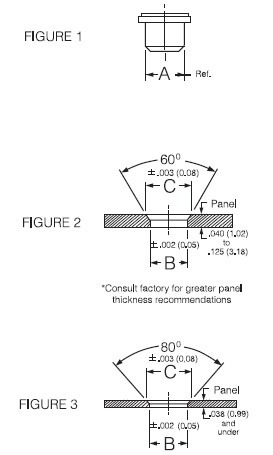 Drill through-hole and countersink panel according to panel thickness, Figure 2 & 3, see table above. Step 2. Using an arbor type tool in a suitable press. Step 3. Press part into centre of panel mounting hole until shoulder of Teflon insulator is fully seated against panel, Figure 4. Raise tool and the job is complete.